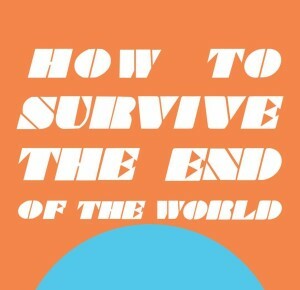 last week my sister autumn and i launched the pilot season of our podcast How to Survive the End of the World. you can subscribe wherever you listen to podcasts. and we’re on facebook, instagram and twitter. for this pilot season we’re in a lot of questions. there’s so much we want to tackle, but first we want to just let y’all get a sense of who we are, what we do, how we think. we have one interview this season, and are starting to organize future interviews that are organic and of interest to us to intersperse with our conversations. in our sister life we talk a lot about beginnings and endings, about survival and science fiction, love, grief, transformation, movement facilitation, passion, writing – everything. the podcast is mostly to open these conversations up to others who we think are interested in this same content. for this first set of episodes, we are just learning everything – how to record without picking up all the sounds in the universe, pace, how our voices sound alike and different, our verbal tics, our rhythm with each other, and how our ranging conversations can make sense and be of use to listeners. we welcome/desire feedback – please let us know what moves you, if we lose you, and what you would like more or less of. please don’t pitch us your work! we’re proud of you, but that’s not how we’re going to generate content. we want listeners, and we want to be shaped by and for and with our listeners…we have a ton of content already lined up. so grateful to Mahfam Malek for the awesome name, Tunde Olaniran on musical offerings, and very very especially Zak Rosen as our beloved producer. thanks for believing in us and making a podcast even though you were already making a baby this season! i think that’s all for now, xoxo. ps. shout out to our sister April! she is excited about this podcast too. 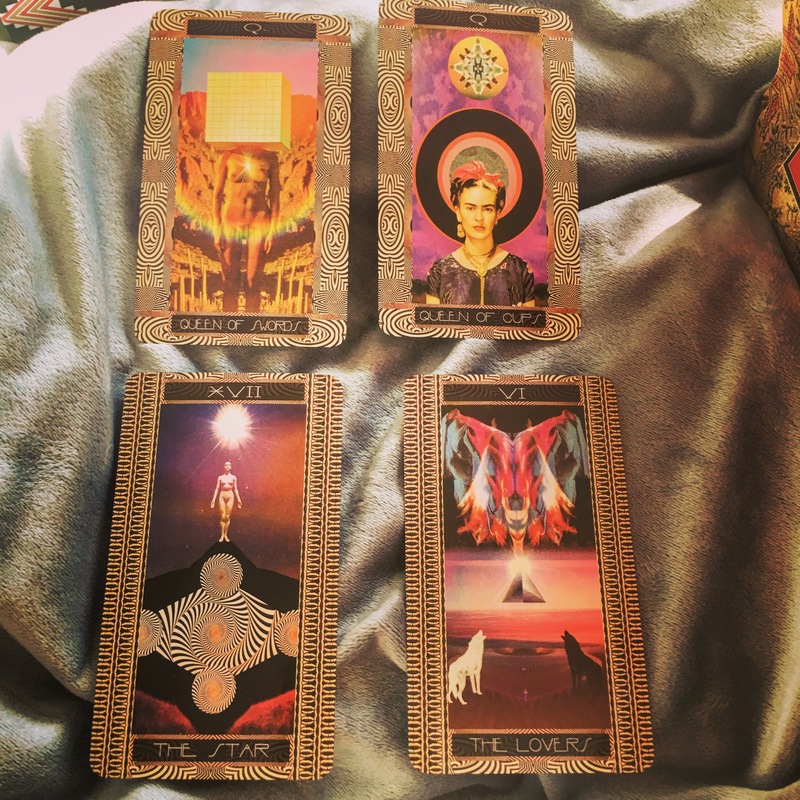 some of you know about #resistancetarot, #movementtarot – each day since the 2016 election i have consulted the tarot to ask the universe for guidance for our movements for justice for people and the planet. i post these on instagram. on saturdays i do a past/present/future spread on the week we just survived and the one to come. 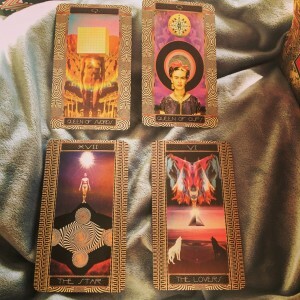 on sundays i do a relationship spread to explore our interactions with various experiences or systems – trauma, funding, etc. this came through yesterday and i want to lift it up. #sundayspread on the relationship between movements and (outgrowing) patriarchy. patriarchy is dying as a system, fighting for air where no more can be offered. so what do movements that include men, masculine of center people, and others shaped in reaction to/defense from patriarchy do/be now? well damn. unexpected deep read. from serpentfire tarot deck. whispering no. no not this many no. we are terrified of love. be kind. speak from the heart. look back through time to the wound, and forward to the medicine. ask curious questions when you feel an assumption coming. listen to the answers with a soft face. look for the best, and invite it to be brighter. be an irresistible invitation to the future. it takes so much rain to feed the potential fecundity of our home, to meet it in the earth and promise it the sky. so if you need to cry, water yourself, water us. love is profound, it is the reason we risk the grief and heartache and confusion and loneliness. soon those who cannot feel will become irrelevant, for we are awakening to the places beyond logic, beyond the histories we’ve been sold, our strategies imbued with witchcraft and longing, our structures surrendering to what our bodies and hearts know about belonging. even when we win in this new-tired paradigm we know it is the step and not the destination. this is all, the learning, the loss, grief and the realization it’s all part of love – even if it’s always yearning. can’t you feel it? somewhere in your lineage is peace, pleasure, dance, love. is justice, is freedom, is how to be on this planet, is love. it might be behind or ahead of you, but there is a lesson we need that only you can touch. death too is a flow, even if it goes where we cannot see. but you, reading this, you are not dead yet. you are here with a million choices. i choose pleasure and liberation. when i was invited i thought it was spam or a mistake. then very coherent emails keep following up. i looked on the internet and yes, it was true, the Obama Foundation was having a summit on those dates in chicago. i didn’t really have time to go. as y’all may remember, i identify as an American revolutionary who endorsed Obama, twerked on a cop car the night he won, critiqued him with my work, and eight years later thanked him for taking on the impossible job. i am curious about where they go from here with all that sun-kissed we-survived energy. i am curious about whether emergent strategy can help them, without being coopted. and i was asked to be on a panel about the role of fiction in social change (Octavia’s Brood) moderated by my college friend Courtney Martin, with NY Times bestselling author Angie Thomas. a chance to plant seeds. day 1 i wore see-through black lace, cream tulle, bright lipstick – femme armor; if you are dazzled, you won’t see that i’m shaking. my friend Sally Kohn saved me a seat at the opening event and basically held my hand through the first hour until my outsider anxiety settled. i centered in my analysis and what i care about, and realized i have enough ground to be able to listen with an open heart. so much happened so quickly – the Obamas were actually there (i know, duh, but still), they set a no selfies rule (grown folks business! as Oprah says, be 1000% present!). there were amazing speeches (my favorites were Heather McGhee and Anand Giridharadas), and people like Thelma Golden and Lena Waithe and Krista Tippett were just walking around. yes Lena is that fine in real life. and gracious. the first time we met i was too shy to interact much, though i did thank her for her existence and she did compliment my look (style icon compliment swoon). the second time, she sat behind me while Michelle was speaking. now, i didn’t know she was sitting behind me, just that whoever was right behind me was all up in my ear saying “mmhmm, yes, that’s right, preach” at all the same times as i was, and thus we were kindred. so when i turned around and saw that it was Lena, i just hugged her (cue Insecure-style vision of our great love). she smells so right, and deserves this full paragraph of adoration. on the first night there was a big gala style dinner with assigned tables. we all went over there in buses, and it really was like, buses of excellence. the biggest impression i was left with from the entire summit was that there are so many people who are solution oriented and sane, divergent but in conversation with each other, brilliant people focused on the future. and i have to take Octavia’s lesson (everyone is a potential ally) seriously and understand these brilliant people as potential allies in the work i am passionate about. and everyone, big speaker and participant, was on the bus. i rolled over with my new friend Candice, who is part of the Harriet Tubman Collective. we got little cards with our table assignments and headed into the museum. my table number was 46, which i assumed meant somewhere near the back. in fact it was right up front and center. and when i got there there were several other people all looking at the little cards with our names on the table. my internal dialogue at this moment was – “whaaaaaaat? but do they know who i am? who i serve? but i’m a post-nationalist revolutionary! how do i best use this moment to grow our work? and then i heard my nibbling Mairead’s voice in my head saying “my fravorite name, Barack Obama”. we were all surprised and unable to play it cool, so we sat and bonded with each other a bit until everyone was seated and the Obamas arrived in the midst of the black suited security river that flows around them. President Obama hits the same intersection of charming, handsome, smart and corny as my father – universally appealing (unless you’re racist, which, go heal…or just can’t with presidents, which i respect). he feels familiar. he and Michelle walk with dignity and ease in their bodies. he talks with long, thoughtful pauses and when he smiles it reaches his eyes. his presidency is behind him, and he seems excited about what is ahead of him. Michelle was one table over, facing me, and i think we caught eyes and had a moment – but i haven’t been wearing my glasses so i can’t swear by it. a group called the People’s Supper set the tone and i was really moved by Jennifer Bailey, one of the founders of the group, who shared her family story with deep vulnerability from the dinner stage. we then had facilitated time (good job Whitney!) to share a bit about our names and how we show up in the world. two minutes to tell the president how i show up in the world? i spoke of magic, miracles, writing, facilitation (it felt good to speak the names of Movement for Black Lives, Black Lives Matter at that table) and love. 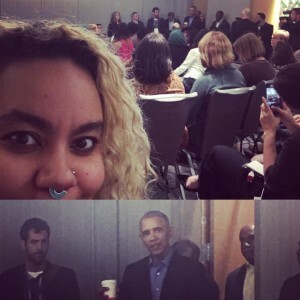 Obama gave me a big hug at the end, said he saw the love goddess in me. i felt similarly, that i saw in him, and in Michelle, a great love – for each other, for the nation, for our species. we are walking very different paths, but love guides those paths through the impossible. afterwards i felt grateful to be in practices of complexity. the next day i attended a session on design of the foundation and wrote community benefits agreement all over the pages. there’s no reason not to do one and model that as a best practice for development that serves the people. then i did my panel and the highlight was Angie, a YA writer whose novel The Hate U Give is slaying the NY Times bestseller list. she told a story about her love of 90s foundational group TLC that made us all gasp and concluded with a big reveal. we had to cue Waterfalls before the panel was over. Courtney was a masterful moderator and we had some truly authentic time together. shortly after that i was sitting in on the fantastic Mia Henry’s session and the president came through to listen, and was asked to say a few words before he left. i honestly don’t know that he said much, but that might be because i was busy snapping this abysmal photo. i left before the concert, feeling hopeful. i think that was the point.